The first cricket match of which a record is extant was played on 16 July 1870 at Victoria Park in the St. Andrews district of the Settlement, about half way between Winnipeg and Lockport. Three years later the record shows the game also played in Selkirk, and the score book lists teams fielded by the military battalion and the civil service. 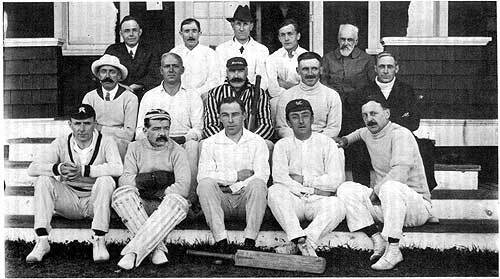 In 1882 a Winnipeg cricket team went east for the first time to play a series of matches in Ontario and Quebec. The tour lasted from 19 July to 5 August and proved a resounding success for the Winnipeggers. They played against Toronto, London, Port Hope, Ottawa, and Montreal, and beat them all convincingly, the margin of victory being quite wide in all matches. The detailed scores appear in J. E. Hall’s and R. O. McCulloch’s monumental work, Sixty Years of Canadian Cricket, first published in 1894 and, although now long out of print, still available in the Winnipeg Public Library. Even during the long doldrums, of course, the game continued to provide ample attractions for an initiated and devoted minority. The long tradition of cricket as an essential feature of the sports curricula of the big private schools in Ontario and British Columbiathe game was introduced at Upper Canada College, for example, as long ago as 1837has done much to maintain the game in these provinces and has also provided an impetus for its promotion elsewhere across the country. In the past 25 years the game in Winnipeg has received repeated stimuli from a continuing series of inter-provincial competitions, international matches, and a never-ending stream of visiting teams from abroad.